Compact one touch fittings are the smallest one touch fittings (pneumatic fittings, one touch tube fittings ) in the world. The volume is 40% less and outside diameter is 20% less in comparison to those of the standard type. Compact one touch fittings are specially designed for pneumatic installations in equipment that are small and compact in size. 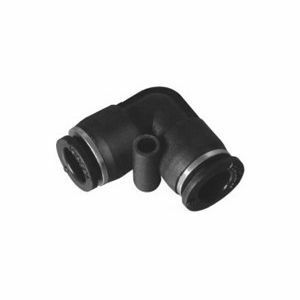 PV-C union elbow compact ( miniature ) one touch fittings connect two tubings of equal tube ΦD at 90º angle, simpley push in 3mm, 4mm, 6mm, 1/8", 5/32", or 1/4" tubings on both sides.